It’s rare to go a full day without reading a headline in your email inbox or on a news site highlighting the rapid demise of the retail industry. Many brands that have become household names are undergoing massive business restructuring or shuttering their doors altogether. Shopping malls that once served as go-to destinations for many communities are experiencing increasing vacancies. The perception largely driven by the media is that brick and mortar retail is a sinking ship, but what is the reality? 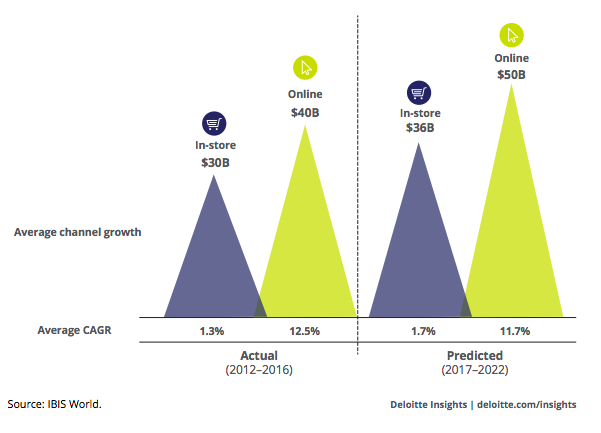 Deloitte set out on a nearly year-long study to better understand the state of retail as it stands today and the driving forces behind recent changes. And what did they find? The silver lining. Despite the onslaught of negative press, retail is still growing and in many places, thriving. Backed by a stable and growing economy, consumer confidence is at an all time high. Experts predict that in the next five years, online sales will grow 11.7 percent annually, and in store sales by 1.7 percent.1 That’s healthy growth across the board. Deloitte found that a big contributor to the success of brick and mortar stores actually comes down to income. Today, shoppers in lower income brackets prefer to to buy in physical stores. As the wealth gap continues to widen, more and more Americans are losing their discretionary incomes and landing in this low earning bracket. The purchases they make will likely be in person, so brick and mortar stores stand to benefit the most from this change in the distribution of wealth. Yes, you know a lot about your customers, but are you investing into the right channels that will lead them (and other audiences who look like them) to make a purchase? As mentioned previously, even details like household income (HHI) play a significant role in the way people shop. Consumers with a low HHI may compare prices online before ultimately going into a nearby store to make a purchase. Your marketing dollars should be aligned with these behaviors. For many brands, it may be time to reevaluate how consumers search, and ultimately buy. Find an agency that can help you understand the unique features of your most profitable audiences, and then identify the right mix of channels to activate them. Small optimizations on the front-end can have a big impact on long-term growth. Eighty-one percent of consumers do online research before making a purchase.2 Whether shoppers are becoming more cost conscious or simply cost aware, the fact is they are more informed than ever before. Retailers should leverage local ads to motivate store visits. Solutions like Google’s Local Inventory Ads and Brand Showcase Ads allow shoppers to quickly locate information on the products they’re looking for as well as their availability in nearby stores. Google also has a feature that allows advertisers to adjust bids for individuals with a certain income range (from the top 10% to the lower 50%), who live within a certain geography. If you’re a multichannel retailer who sells discounted items, you may want to increase bids for searches that originate in an area in the lower 50% household income level. To measure the impact these ads are having on driving purchases in stores, check out Google’s Store Visits tool. Store Visits uses anonymous, aggregated data to measure the number of people who click or view ads and later visit a store. The digital and physical shopping experience shouldn’t be planned in silos, rather they should be developed as a consistent end-to-end experience. Forty-two percent of in-store shoppers search for more information while in a physical store3 and savvy retailers like Sephora are combining digital elements into their physical stores to make it easy for shoppers to explore, find and purchase the products that are right for them. Discount retailers like Marshalls are making the physical shopping experience more social by encouraging store visitors to share their unique finds with their social networks using the hashtag #marshallssurprise. Brands and retailers often market to the same consumers, so by working together, their power is magnified. With ecommerce set to experience double-digit growth over the next five years, digital co-op investments are a great way for brands to increase their exposure online and drive sales across channels. The right agency can help you identify, manage, and measure the outcomes of these opportunities. While the Retail industry is alive and well, we are seeing a massive shift in the way multichannel retailers operate to meet the changing needs of their consumers. And let’s not count out pure-play e-tailers. Amazon is working hard to turn low income shoppers into loyal customers. Individuals who receive government assistance can qualify for a reduced $5.99 a month Prime membership, and EBT cards can now be used to pay for qualifying groceries. We expect that as brands compete more on price and free shipping becomes more universal, consumers from all income brackets will begin to make more purchases online. Here’s to building the new. You can access a copy of the Deloitte study, The Great Retail Bifurcation, here. I just read a Content Marketing article which discussed whether Content Marketing needs to be rebranded now that it’s been a buzz term in the industry for a handful of years. For those of you that know me, I absolutely loathe forced marketing lingo. I’d like to think that many people see right through it, but maybe I’m overestimating the “BS” meter than people are born with. With that said, imagine ourselves in a professional situation. Let’s assume we're colleagues and we’ve come across one another at various events and we have a cordial professional relationship. At an industry event, I turn to you and say,“What are your thoughts on leveraging a synergistic approach to acquiring palliative hydration?” Translation: “Do you want to go grab a beer with me?” Of course, you wouldn’t want to get a beer with me, because I’ve just outed myself as a giant arse. For some reason, I feel that marketers are constantly trying to reinvent the wheel. I get it. Our job is trying to sell things, but whether we’re trying to sell something to fellow marketers or the general public, a certain level of honesty needs to be involved. This notion is especially true in the case of content marketing. Content marketing is pretty simple. Employ a value based entity with the desired outcome of positive absorption (Non- jargon translation: Write stuff that people want to read that provides them with value). Google has figured this out. Organic rankings are no longer filled with fluff results from SEO’s overstuffing keywords and manipulating the latest algorithms. Sure, there is still an art to SEO, but organic rankings are now based on Google’s machine-based algorithms, aka robots, who ignore all the cheesy jargon. And while we are on the topic of cheese, let’s talk about a real life example. If you’re a brand that wants to sell more cheese, try positioning yourself as the ultimate authority on cheese. Answer all of the questions people have about cheese in a useful and valuable manner. Google will see you as being a purveyor of valuable content. People will start thinking of you as an authority on cheese and they’ll trust your brand more than the brand that just tells you that their cheese is the best, and then talks about how great their founders are. If you don’t tell them which kind of cheese pairs best with Pinot Noir, somebody else will. What it comes down to, is that agency folks need to be honest with brands. Content about mission statements or awards is not what converts. People are generally not interested in anything aside from what they’re typing into a search engine at that specific moment. Be their buddy and give them an answer they’ll feel good about. Do your research to figure out what people are looking for. You just might be rewarded with free organic traffic for years to come. I recently read a stat from CMO.com that said 56% of consumers feel more loyal to brands who “get me” and show a deep understanding of their priorities and preferences. It reminded me of a conversation I had at an event with a woman who walked up to me and said, “Can I ask you a private question? Just what in the heck is a DMP?” Those two things highlight the disparity between the need for data-driven, personalized marketing and just how tough it is to figure out how to do it. The woman at the event who asked me that question is not alone – I get asked some form of it all the time and from really experienced, savvy marketers. They know that they need to care about data’s impact in their campaigns and they usually have some great ideas for how to personalize content so it’s meaningful for their customers. However, they are absolutely lost when it comes to understanding how to capture, analyze, and actually use the data. A data management platform (or, DMP) is extremely helpful for that, but it can feel overwhelming to figure out how to build and maintain one. 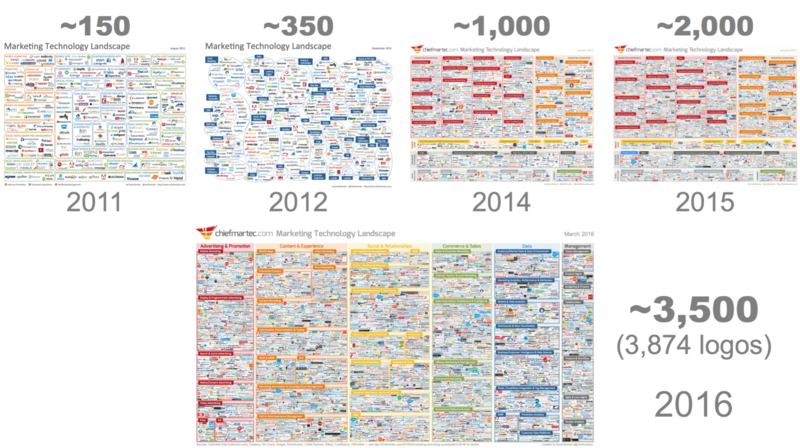 With the number of MarTech tools growing exponentially every year, most marketers don’t even know where to start. Add to that the significant investment in money and time as well as a potentially foggy ROI and it can be easy to slip into analysis paralysis. Since I get asked so frequently, I thought it would be helpful to start with the basics on what the heck a DMP is and what kind of campaign results can be garnered using one. To start, a DMP is basically just a big database that stores a bunch of different data points on your current and potential customers. It can be populated using 1st, 2nd, and 3rd party data which is then combined to identify patterns in the way your target audiences shop, spend their free time, consume media, and move about the world. Using a DMP, marketers have the ability to get deep insights into their customers, such as what other retailers they visit and how frequently they are viewing their website versus going into stores. When paired with media trafficking systems, like a demand-side platform (DSP), a DMP is able to use those insights to inform personalized media campaigns and deliver messages to consumers at just the right time and on the right device. They are pretty amazing things. Of course, that amazingness can come at a hefty cost. There are plenty of vendors out there who will set up your own DMP using their infrastructure and your data; the average estimated cost to get started is around $250,000, not a small investment by any means. Maintaining and optimizing the data over time is an additional cost. Some companies do invest in building their own DMP, but with the necessary staff, servers, and security precautions, you can quickly surpass the cost to outsource. Before you feel you have been priced out of the game, I have good news. There are several companies, of which AMP Agency is one, who have gone through the hassle of setting up and populating their own DMP, allowing clients to use them for their campaigns for a fraction of the cost. AMP’s DMP is called Advantage Media MomentAware,™ and has been created by partnering with some of the largest data providers. Also through our partnerships with the largest retailers and consumer packaged goods (CPG) companies in the world and our own 2nd party (proprietary data), we are giving our clients access to informed insights . We made this investment and continue to build on this proprietary data investment because we recognized that our media products wouldn’t be cutting edge without it; in fact, the market is evolving so quickly that pretty soon media products that don’t leverage insights from a DMP will be deemed obsolete. Target specific stores – with MomentAware, you are able to use location-based targeting to deliver media to specific store locations. Have a store that has an abundance of inventory of one item? Run a campaign in the local area to drive in-store traffic. This also can be used to exclude locations that don’t have the item in-stock, particularly during promotions. Save your valuable media dollars to only spend where shoppers can take direct action v. running a blanket campaign. Connect online actions to in-store visitors – In a recent Salesforce consumer study, 52% of Millennial shoppers said they strongly/somewhat agree that it would help them if a physical store knew about the online research they had done prior to getting to the location (e.g. wishlists, abandoned cart, etc) so they could receive better service. Using MomentAware makes that possible – it associates mobile device IDs and cookies (computer) to understand site activity and when that device is in store. Imagine that the shopper gets a relevant ad or offer with a store locator when they are browsing prior to going to the brick and mortar location. Better, more relevant experience, both online and offline. With MomentAware, it’s easy. These examples are just the tip of the iceberg when it comes to using data in creative ways to deliver personalized experiences. Using a DMP is integral to activating on data quickly and easily. Are you using a DMP? Let us know your experience in the comments.